You’d think with all these food posts that I was pregnant or something! (No, I’m NOT pregnant – that would take an act of God!) 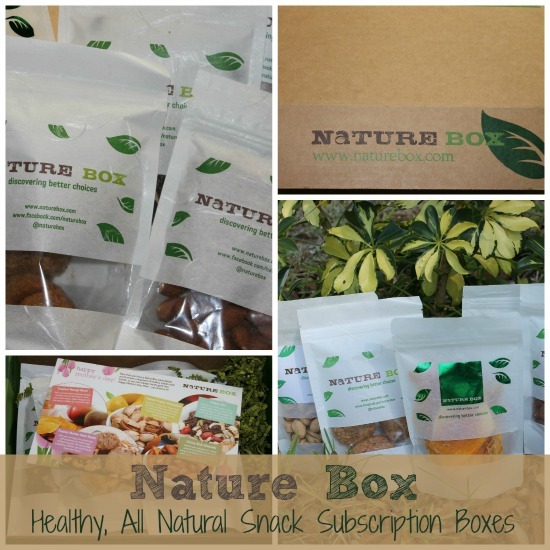 I have to tell you about a really cool subscription box that I was gifted by NatureBox. Subscription boxes are all the rave right now – you pay a monthly fee and each month you get a surprise box of goodies sent to your house. NatureBox starts at $19.95/month and you get 5 full size bags of healthy snacks that you feel good about eating and sharing with your family. I received the special May box that was inspired by Green Living Expert, Sara Snow. Inside my box were tropical mango bites, lemon pucker pistachios, citrus kick almonds, mighty mix (trail mix), and my absolute favorite — Peanut Butter Nom Noms! My kids ate most of the almonds and pistachios while I devoured the nom noms! I had to share them with the kids but I didn’t want to – they were THAT GOOD! 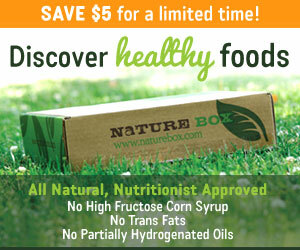 What makes NatureBox different? When you sign up the price for the regular box is always $19.95/month (unless you have a coupon) regardless of how many months you subscribe to. They do an auto-renew type service but the price is always the same. If you want to cancel later all you need to do is contact them but why on earth would you want to stop receiving these healthy goodies in your mail? I have to go shopping and don’t frequent our local health food store because it’s “out of the way” so I am limited to what I can find at Publix when shopping for snacks. You can’t find anything like these snacks at Publix for this price. No high fructose corn syrup, no artificial flavors, no artificial colors, and no trans fats! What are you waiting for? Go sign up so you’ll get the June box delivered to your door. My kids will be home with me almost all summer so I need to stock up on healthy snacks for the summer! 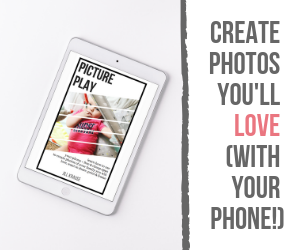 Disclosure: I was gifted the May NatureBox in hopes that I’d share it with you and the links in this post are affiliate links; help fund my new subscription box addiction!